So who doesn't like a bit of Peri-Peri Chicken? We are big fans here of Nando's and we see they are currently running a competition which could see your artwork featured on their menu covers in every Nando's throughout the UK! Not only will your artwork feature on the cover but they will also include a write-up about you the artist which will also feature in the menu itself as well as on the Nando's website. And if that wasn't enough they are also throwing in free Nando’s for a year* as part of the prize. The brief is pretty open, the only requirements are that your work is handcrafted and in proportion to the size of their menu (205mm wide by 315mm high). This competition is open to everyone and they are happy for you to can use any medium you like – paint, pencil, collage – but no photography, as it isn’t in keeping with their style. If you think you have what they are looking for you better get your skates on as the deadline of December 1st is almost upon us. 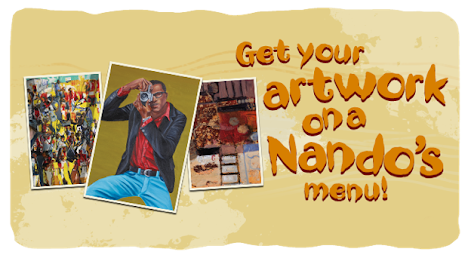 All the details and entry forms for the competition can be found on the Nando's site here. Good luck everyone! UPDATE: OK so Nando's have just extended the deadline on this and is now the 7th December 2012, which is good news as we have only just started working on our design! *Terms and conditions apply.